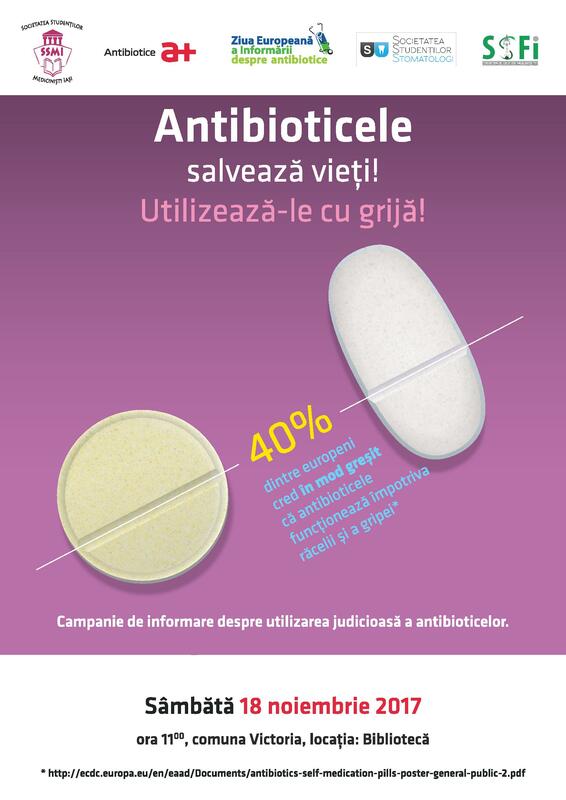 Between November 18 and 25, 2017, to mark the European Antibiotic Awareness Day, Antibiotice offered its support to the „Antibiotics save lives! Use them responsibly!” caravan, a project initiated by the „Gr.T. Popa” University of Medicine and Pharmacy students’ associations, for the third year in a row. The caravan will travel to the towns of Victoria, Mironeasa and Voinesti to inform and educate the inhabitants on the rational use of antibiotics. „It was our intention to have an information caravan in the countryside this year because we believe that the people in the area, who have less access to healthcare professionals , should receive correct information on antibiotics and the responsibility of each of us for their wise use”, said Eliza Maria Froicu, a project coordinator and member of the Medicine Students’ Association Iasi. The first action took place in the town of Victoria on Saturday, November 18, 2017. The company’s representatives and medical students distributed brochures containing useful information on the role, benefits, risks as well as the responsible use of antibiotics to the inhabitants. „This information campaign is very useful because we tend to take antibiotics for any health problem we may have, thinking it will cure more rapidly. Despite the good advice our physicians give us, I have to admit that we do not always follow it; however, I have realized we could have serious problems in the future and that is why, from now on, we will listen to our doctors’ indications”, told Mariana Pavel, an attendee. Moreover, in the town library, the family doctor Ms. Gabriela Berheci was invited to hold a lecture on when and how antibiotics should be administered and ways to prevent resistance to antibiotics, so that these life-saving medicines keep their effectiveness both for the present and future generations. „We must take much care of our future, use antibiotics correctly and educate our patients accordingly. Unfortunately, we have dealt with infections resistant to antibiotics lately and our patients are admitted to hospital in serious conditions more and more often. That is why I find it useful to have some reference books with indications for the use of antibiotics both in doctors’ offices and hospitals; it would help us have resources in the future to fight against bacterial infections. We would like to congratulate the students for their project and I am glad to see that they are thinking of their later work as early as their university years. If we do not do what we should now, there will be no therapeutics resources available for them in the future”, stated dr. Gabriela Berheci, a family doctor from Victoria. Similar actions will be carried out in the towns of Mironeasa and Voinesti this week. The ethical involvement of Antibiotice in actions designed to prevent bacterial resistance is part of the company’s mission to manufacture drug products responsibly. As a manufacturer of antibiotics, we are interested in preserving the value of these medicines, which, if used rationally, save lives. Getting involved in such campaigns results in the increase of people’s awareness and sense of responsibility to the purpose of keeping antibiotics effective in the long term. Responsible use of antibiotics makes suffering shorter and life longer.